If you have been following me, you’ll know that I love old things. 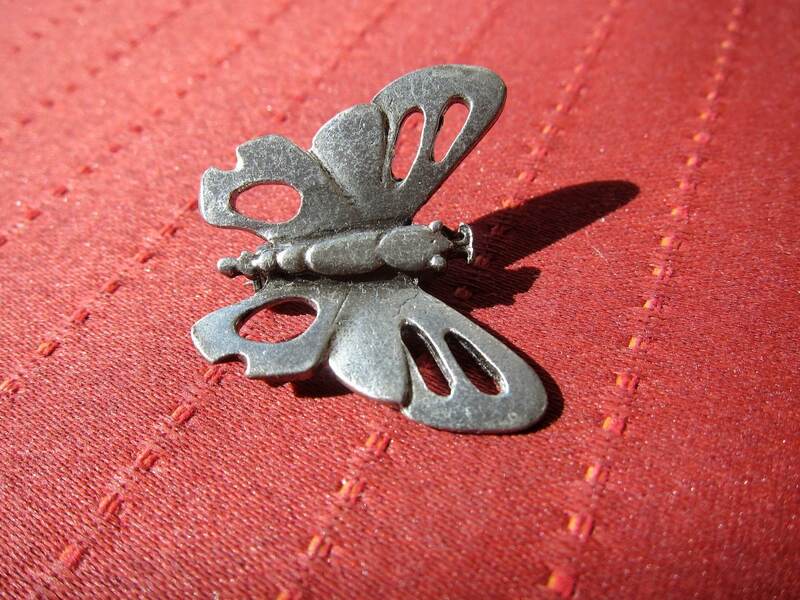 Vintage and antique jewelry is a long time love of mine, and something that I find inspiration from. It’s not just about wearing jewelry; it’s the history and the story. Materials which followed a location or design that followed fashion. Lately I’ve been focused on learning some repair techniques for vintage pieces. The passion to restore and repair is strong, but when presented with an old piece which is not quite at its best, I’m faced with a dilemma: do I restore the piece to as close to its original state as possible, or do I modernize it and make it more wearable or do I turn it into something completely different? I try and let the piece speak. In the case of some Art Deco pieces which are mostly intact, I fully intend to restore them to their original splendor. 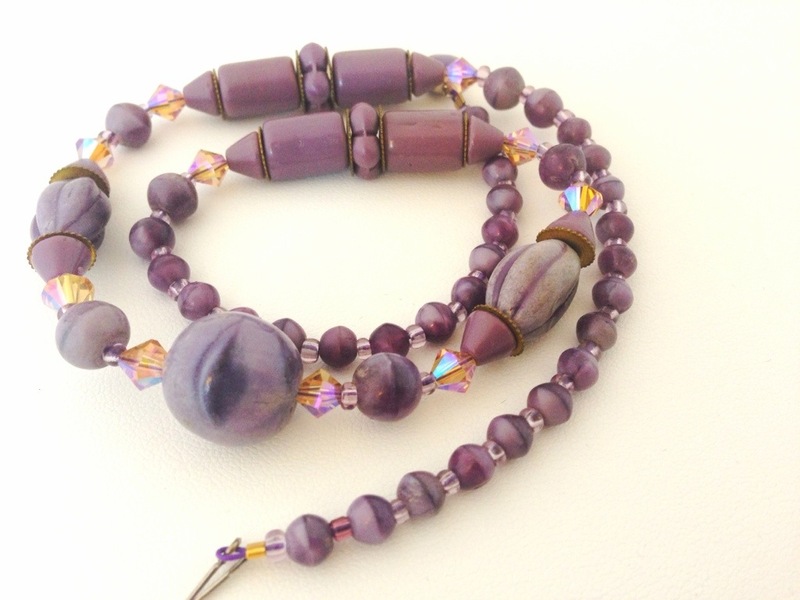 But what about the necklace which is too short, or too dull, for modern tastes? 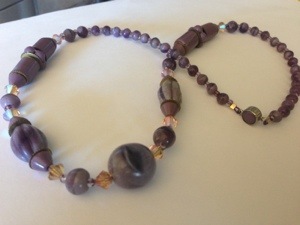 In this particular case I rescued a broken necklace with beautiful brass spacer beads. The purple glass is lovely but frankly I thought a bit dull. At just about 15″ it’s also too short for me – and for most people to wear elegantly. Enter the redesign. Some lovely genuine Swarovski crystal aurora borealis bicone beads picked up the brass and the purple tones and allowed the length to creep closer to 16″ After considerable thought I decided to go with modern softflex wire in a purple hue which would show through the clear glass seed beads in the original necklace, and definitely show that the piece had been restrung. 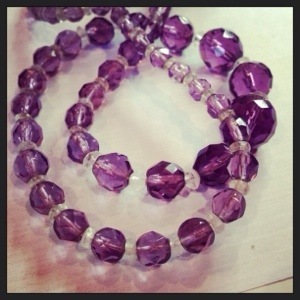 The last decision was to whether to replace the clasp. It was in excellent original condition and stamped with Czechoslovakia. Again, I while I have no interest in misleading anyone, I think the clasp looks lovely with the piece, so I chose to retain it. 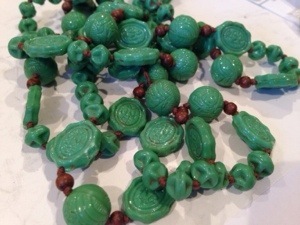 Two others I’m working on are going to be completely redesigned into new necklaces that incorporate vintage beads. 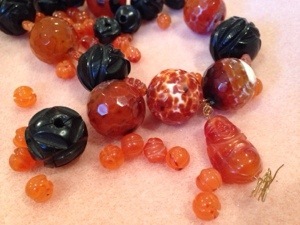 A black and amber one features genuine Whitby Jet and carved Carnelian. Another is going to be wedding cake yellow beads are vintage Art Deco and I’m likely going to pair them with freshwater pearls and Swarovski crystals, but I haven’t settled yet. It takes a while to make the final decision… I choose some designs and then I let them sit for a while. 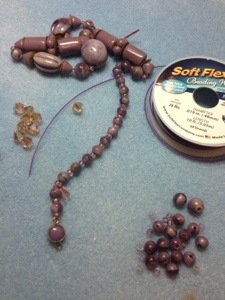 When I come back I tweak the pattern or change out the beads and then let it sit again. It may be months or days or hours. 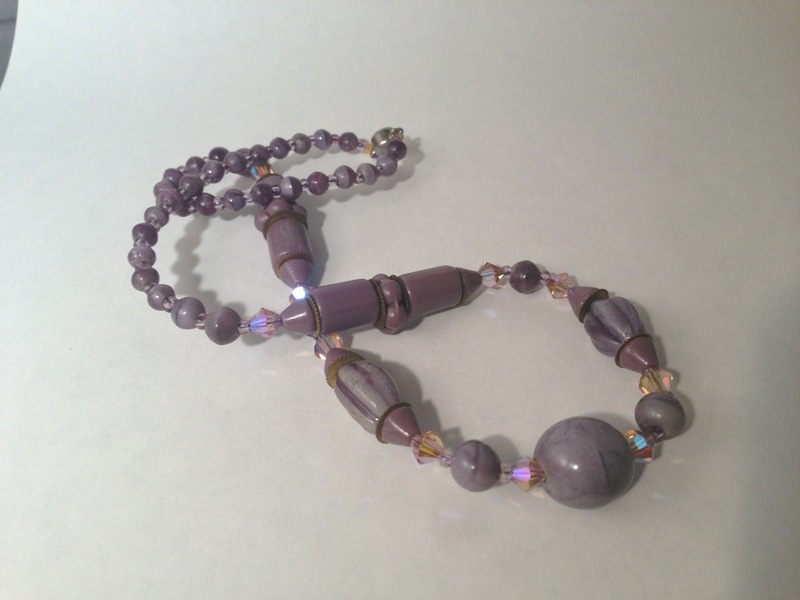 In this case I took a family heirloom amethyst crystal necklace and restrung it exactly as it was – but I added a new clasp. Here is another project which I recently completed. 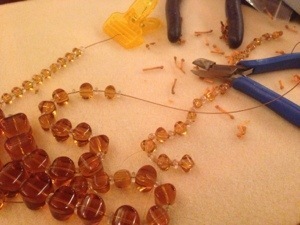 These gorgeous amber glass beads are really heavy. 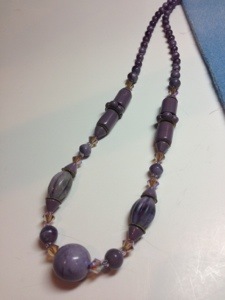 The necklace came to me broken and I’m guessing it is from the 1930s or 1940s. It was originally strung on silk and knotted in between each clear space. I considered restringing it on silk which would make it slightly longer, but I decided the weight would really suit the more modern heavy wire. The clasp took a long while to decide upon. Sterling Silver or Vermeil were my top choices. I thought pure gold to be too much and in the end went with silver. The 2 part barrel shaped hook clasp has this great lotus leaf pattern which I really think makes this beautiful necklace even more special.